This has been a long time coming. Inspired by qkennyq's Q3 map 'Chartres', this map is a huge Gothic Cathedral. Although entitled 'Amiens', the map is not intended as an actual representation of the real life building. All custom materials, models, sounds, textures. 'Pro-gaymers' may not understand this but the level was built without any game play considerations at all. The entire project is about visual art, level design, modelling and 2d art skill. That said I have included game items and optimised the lighting somewhat so that the level is actually playable. 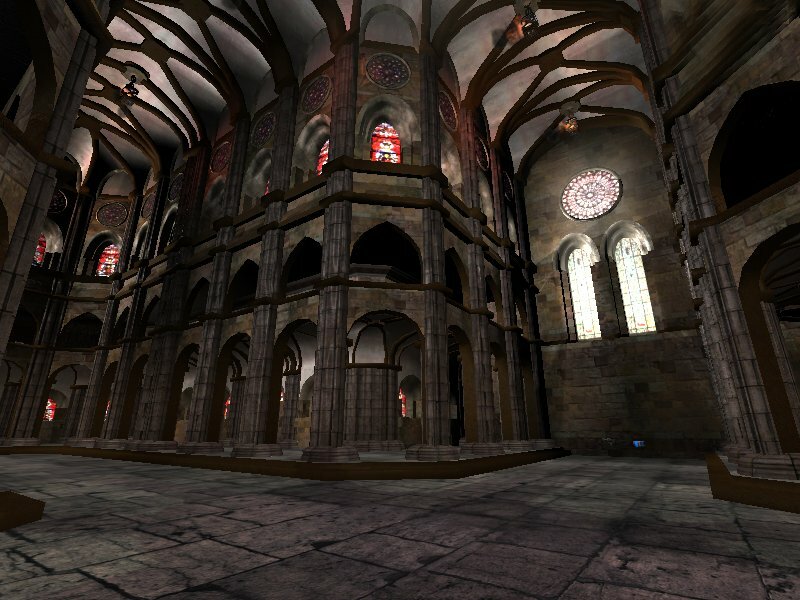 Considering when viewed from one end of the nave to the other the level hits around 500000 tris, I was pretty pleased that on my system at least I was getting around 30 or 40 FPS. This time I have not included a bot file, although SABot for Q4 1.4.2 or the latest Q4Max bots will play fairly well if you want to add your own. In my opinion the SABot does much better than the Q4Max version. Apart from the stain glass windows, all other textures where created from scratch in photoshop or developed from my own photo sourced images. Perhaps around 99% of the level was modelled from scratch externally in Blender3D. Q4edit was used largely as a compositor and compiler.